She is Soul's technician. She is the more level-headed of the two but when her anger gets the better of her, she will put her foot down. Where Soul seems to be the brawn, Maka is the brain. She always tries to think of a way to beat their opponent by exploiting the opponent's weaknesses. Her father is the Shingami's current death scythe. She seems to hate her father for constantly flirting with other women but she still loves him. 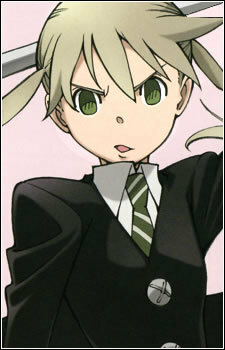 Her mother was also a scythe technician; she and Maka's father are divorced. Maka seems to be annoyed at the fact that her body hasn't developed yet (which is the center of some jokes in the series). She usually kicks Soul after he does something perverted or if he and Blair have been acting too friendly. Dr. Stein saw her soul and told her she was a "serious person who tries hard." Presently, she is a Two-Star Meister and a creator of a Death Scythe. She is a member of the elite unit, Spartoi. In the anime only, in the last episode, the Kishin inferred that Maka actually has weapon blood, due to her father, but chose to be a meister.